Relayr's WunderBar won the Code_n startup competition at the Cebit trade show. Berlin-based startup Relayr charmed the judges at the Code_n startup competition with its kit for building Internet of Things devices, and walked away with €30,000 (US$32,000). The company was one of 50 companies that reached the final and were allowed to show what they had to offer at the Cebit trade show in Hanover, Germany. Since the theme of the competition was IoT, crowning Relayr the winner made a lot of the sense. With its WunderBar and related Sensor cloud service, the company has made it easier to start prototyping and building all kinds of sensor-based products. Relayr's WunderBar includes modules with a sound sensor; an infrared transmitter; accelerometer and gyroscope; light, color and proximity sensor; and a temperature and humidity sensor. 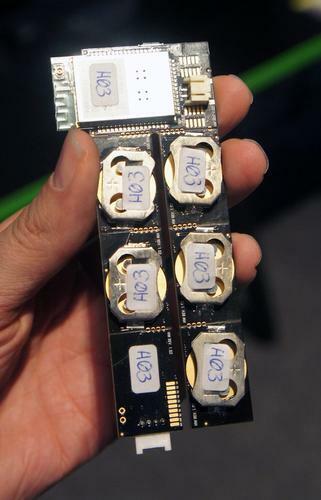 They are all mounted on a circuit board that has a battery on the back and a Bluetooth Low Energy connection. The sensors relay their information to a master module, which has a Wi-Fi connection, and then on to Relayr's cloud service. It's also possible to connect directly to a smartphone. "So the idea is that if you're a business or an individual who wants to start looking at the Internet of Things, you can snap off one of the sensors, put a coin cell battery on the top and then immediately start collecting data from our cloud," said Will Andrews, content manager at Relayr. The WunderBar also has a bridge module that can be used to integrate other sensors or connect it with a Raspberry Pi computer, for example. To build apps that use the sensors, there are SDKs for Android, iOS, HTML5, Node,js, Python and C#. Developers who prefer Ruby will also be able to get their IoT fix in the near future. The whole unit costs about US$200 without tax. The company will very soon start selling the sensors individually, for about $20 to $30 dollars each, according to Andrews. The initial concept for the company was to go beyond IoT the buzzword, and start making it easier to build real things. The winnings will go towards boosting product development, according to co-founder Jackson Bond.